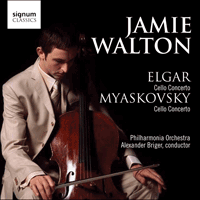 The cello concertos of Elgar and Myaskovsky, written in 1919 and 1944 respectively, engender few similarities these days but make an exciting coupling due not only to the disparate nature of the composers’ lives and situations, but also to the common ground they tread; both composers were in their early sixties when writing their main work for the instrument. A stunning performance by Jamie Walton, accompanied by the magnificent Philharmonia Orchestra. Jamie has enjoyed success as a rising international soloist and has given concerts in some of the most prestigious concert halls in the world. He appears regularly at the Wigmore Hall and Symphony Hall, Birmingham and has performed with leading orchestras such as the Vienna Chamber Orchestra and the Philharmonia Orchestra. Although conceived by utterly divergent characters in lands and times that engender few similarities these days, the cello concertos by Elgar and Myaskovsky make a fascinating coupling due not only to the disparate nature of the composers’ lives and situations, but also, curiously, to the common ground they tread. Both men were in their early sixties when writing what was their only concertante work for the instrument, and the prevailing mood of both concertos is one of aristocratic wistfulness married to a mastery of form and rhetoric. They strike the listener almost as elegies, predominantly ruminant and rarely displaying the cut-and-thrust heroics that are so often an integral part of the concerto genre. Elgar was composing his last truly great work surrounded by the material comforts and fame that Edwardian England had afforded him, while Myaskovsky was penning his final thoughts for the instrument with Russia still firmly in Stalin’s clunking fist. The dates of composition, 1919 and 1944, most probably provide the telling clues as to the introspective, yearning nature of these pieces. Elgar was writing his concerto as the stomach-churning massacres of the Great War were being gradually absorbed by a horrified British public, while Myaskovsky’s Moscow was experiencing the depredations and deprivations of the most desperate years of the Second World War. Little wonder, then, that the feeling of sun-kissed deckchairs being folded-up for good permeates these works. But, amidst the yen for days gone by persists a remembrance of their many beauties reflected in music of depth and radiance. When fiddling with very early sketches of what became his Cello Concerto in E minor Op 85 in 1918, Elgar wrote to the poet Laurence Binyon regarding setting a poem about peace: ‘… I do not feel drawn to write peace music somehow … the whole atmosphere is too full of complexities for me to feel music to it … I regret the appeal to the Heavenly Spirit which is cruelly obtuse to the individual sorrow and sacrifice—a cruelty I resent bitterly and disappointedly’. This adumbrates the mood of the concerto which was written largely in May and June of 1919—far from the most contented year of Elgar’s life. His stalwart wife, Alice, was ailing, and to die the following year and the war had robbed Elgar of more than just his lively humour and calm, bucolic outlook. Practical matters surfaced, such as a house that had now become impossible to run in the grand Edwardian fashion. The war had begun to change attitudes to domestic service with new opportunities for women also brought about by the Suffragette movement. And, understandably angry young men were returning from the fronts of the war with a view of life (and death) that was at odds with recent, but now bygone days, and some of them had strong ideas on the way music and the arts must be expressed in the new age. All this while Elgar’s popularity as a composer was on the wane, with publishers and public alike. The work’s premiere was the centrepiece of the London Symphony Orchestra’s first concert series since the end of the war. Premiered by Felix Salmond with Elgar on the rostrum, the event was poorly attended and somewhat less than a success. The soon-to-be celebrated conductor, Albert Coates seems not to have helped matters by reducing rehearsal time for the one piece in the concert he was not conducting, moving Alice Elgar to write in her diary of a ‘Wretched, hurried rehearsal—An insult to E [Elgar] from that brutal, selfish, ill-mannered bounder A. Coates’. However, the great critic, Ernest Newman saw through the messy performance, writing of a ‘profound wisdom and beauty underlying its simplicity … a fine spirit’s lifelong wistful brooding upon the loveliness of earth’ despite the orchestra making ‘a public exhibition of its miserable self’. The concerto is scored with an emphasis on the high and low orchestral sonorities, allowing the cello a clear space to roam and soliloquise while remaining clearly audible. The piece often feels chamber music-like in its expression and the four movements are admirably concise and fluid. There is also a great deal of solo writing, prefigured by the famous mighty opening chords which the soloist plays almost unaccompanied. The movement is shines with unconventional ideas such as the violas taking the main theme alone, gently, after the audacious solo opening. The Scherzo is a quicksilver moment, dark and fantastical and the succeeding Adagio a painful, passionate condolement. The final movement brings some lightness and humour prior to the cadenza, which soars in pain, the piece closing in an abrupt, almost brutal, fashion. Just 25 years later, in a radically different Europe, Nikolai Myaskovsky (1881–1950) produced his own concerto, premiered by its dedicatee, Sviatolslav Khushevitsky, in Moscow on 17 March 1945—less than two months before the end of the Soviet Union’s participation in the Second World War. Much like Britain at the end of the Great War, the USSR’s victory was significantly over-shadowed by the unthinkable number of casualties—gigantic even by the standards set by the earlier war. Myaskovsky was born in Tsarist Russia and brought up in Novo-Georgiyevsk, a Russian garrison town near Warsaw and attended one of the most prestigious Russian military schools in Nizhniy-Novgorod. Thus, the military and its codes were simply part of his life from his earliest days. A musical bent was supplied by an aunt and in 1903 by private studies with Gliere on the recommendation of Taneyev. Despite the pull of music, it wasn’t until the age of 25 that he eventually left behind his career as a military engineer and enrolled in the St Petersburg Conservatory in 1906. That two such esteemed Russian composers should be happy to help a relatively late developer merely hints at the musical milieu available to musicians and composers of the time. At the conservatory, Myaskovsky studied composition with Liadov, orchestration with Rimsky-Korsakov and his younger contemporaries included Prokofiev, with whom he forged a life-long friendship. The super-talented and brash young Prokofiev was mature enough to realise that the introverted Myaskovsky was a man of talent, great learning and insight: one of the few from whom he would bear criticism, but also one who would happily go into print to defend some of Prokofiev’s controversial premieres. Among Prokofiev’s many dedications to Myaskovsky are the opera Maddalena and his Third Symphony. Myaskovsky’s military training came back to haunt him and he was sent to the Austrian Front where shell-shock took it’s toll and he was transferred to the Naval headquarters in Petrograd and eventually demobilised in 1921. Taking up a post at the Moscow Conservatory, he remained there as composition professor until his death, tutoring many brilliant pupils including Khachaturian, Kabalevsky and Shebalin. While his introverted nature led him rarely to stray from the party line, his musical thoughts often did so, and he was not spared during Stalin’s infamous 1948 intervention into the Soviet musical world that terrorised many of the most famous Soviet composers—Shostakovich and Prokofiev included. Myaskovsky was himself severely rebuked for writing a ‘gloomy’ Symphony No 26. From its opening moments, Myaskovsky’s Cello Concerto in C minor Op 66 is an unmistakably Russian affair. The opening Lento’s dark, portentous opening has often been compared to the brooding ending of Tchaikovsky’s swansong Symphony No 6. This dolefulness gradually gives way to a flowering of melodious writing for the cello, subtly balanced by the odd melancholic rumination. The second and final movement, an Allegro vivace, has an initial spring in its step with further hints of Tchaikovsky, now in a chattering, more playful mood. Again the joy is but momentary: a long-spun threnody, peppered with specks of sweetness and infused with folk-like melodies, builds to a troubled orchestral climax. The concerto’s final moments are remarkable; the mood softens into the major and the predominantly dark colouring of the work lightens upwards in register and to a calm close. In comparison with Elgar’s disappointedly abrupt, Edwardian termination, Myaskovsky’s concerto closes serenely, the long and troublesome journey eventually affording a form of tranquillity—an acceptance of what is.